FRANKFURT, Germany – d&b audiotechnik launched its SL-Series, GSL loudspeaker system at the 2018 Prolight + Sound tradeshow. The system was used recently in Stuttgart Arena, Stuttgart, Germany (pictured here). Prolight + Sound 2018 sees the launch of the d&b audiotechnik SL-Series, GSL System, a new loudspeaker system sitting right at the top of the company product portfolio. 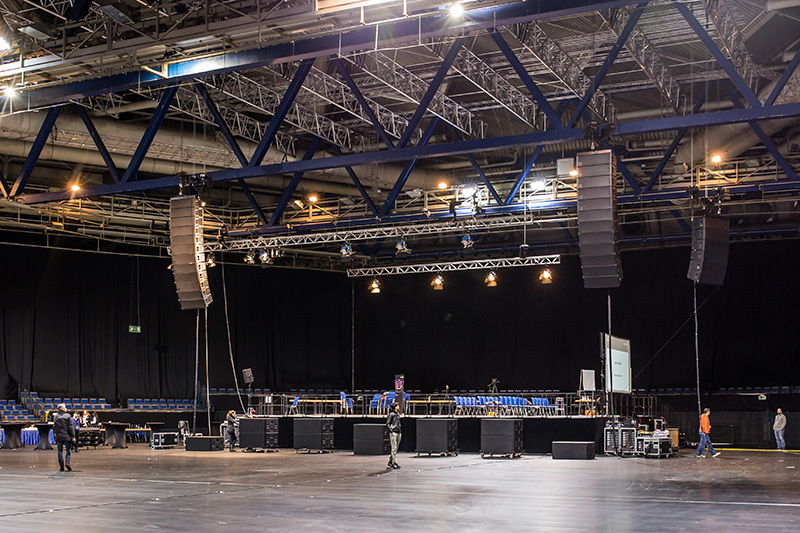 The team at d&b frequently discussed larger loudspeakers sitting above their current product range – a system ‘big’ in more than one dimension. Due consideration of this put a challenging set of attributes for the SL-Series squarely on the table, just delivering ‘bigger’ not being enough to satisfy the d&b tenacity. The GSL8 and GSL12 loudspeakers, with 80˚ and 120˚ horizontal dispersion respectively, are unique among large scale line array modules in providing consistent pattern control all the way down to 45 Hz. The geometry of two front facing14” drivers and two side firing 10” drivers couple and apply cardioid techniques, creating precise directivity behaviour with significantly extended low frequency headroom towards the audience. This low frequency extension and headroom is so effective that it negates the need for subwoofers flown behind or alongside the main hangs in many applications. Mid-range is delivered by a high sensitivity horn loaded with a 10” driver, while three innovative, custom designed 3.4” diaphragm HF drivers mounted on a wave shaping device provide the high frequency resolution and output.